The blade of the reigning European Finalist, Patrick Baum.The artificial Aramid-Carbon fibre in combination with high quality woodplies ensure a precise ball return and outstanding offensive quality to the blade. In addition to being very fast, the Baum Esprit ensures maximum ball control in every playing situation. It is particularly suited for counter top-spinning and for touch play. This blade is ideal for attackers who value spin but require sufficient speed from their strokes. 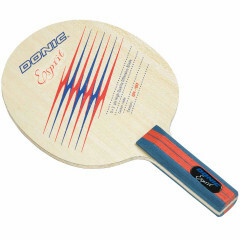 Donic Blade Baum Esprit is beeing added to cart.